I just wanted to say thank you for being such wonderful tenants, looking after the house so well and particularly for all the improvements you made. The bathroom looks particularly wonderful. 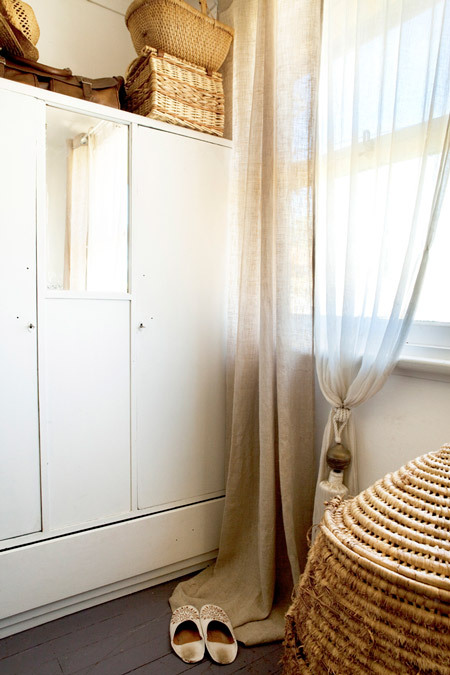 A COSY RENTAL HOME: A peek into the little Guildford cottage that Nelly put work into to make it a gorgeous warm home - that her landlord thanked her for. Photo by Heather Robbins of Red Images Fine Photography. Last week I wrote about this lovely little Guildford cottage, pictured above, and its tenants, Twinkle and Whistle interior designer Nelly Reffet, her partner Sam Desmaris and their toddler daughter Rose. I mentioned that Nelly and Sam had actually carried out some renovations to the house and its gardens – yep, a house they rent! After the story came out, Nelly wrote to me two days later to tell me she had just received this lovely letter from the home owner, who had seen the story and was stoked - and sad to see such wonderful tenants go! 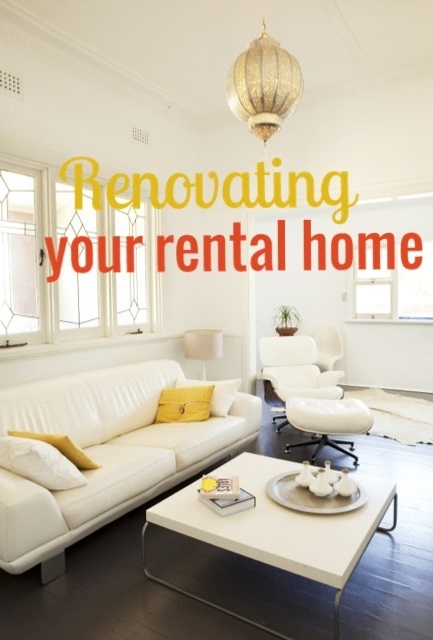 Nelly is proof that you can do renovations to a rental and that it can even strengthen your relationship with your landlord who may prefer a good tenant who looks after their property over raising the rent (worth thinking about when rental stress is now said to be at an all-time high in Australia). 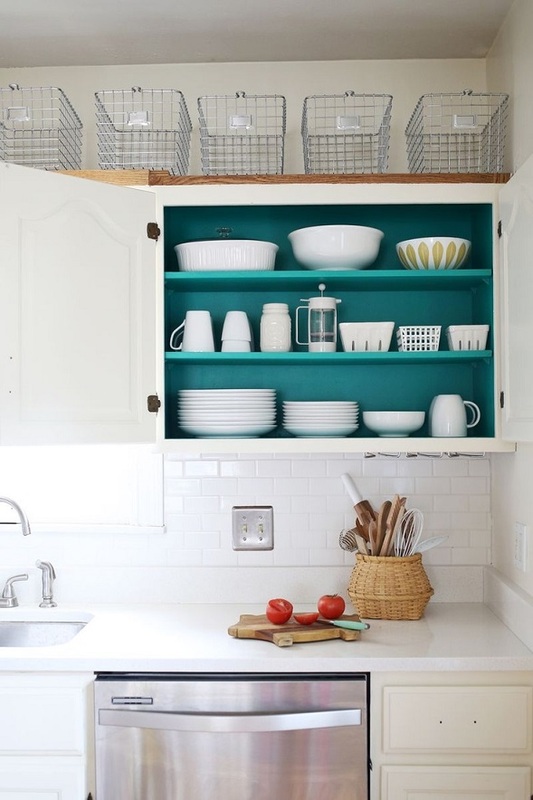 RENTAL RENOVATING TIP - ADD A PEEK OF COLOUR: Paint the insides of your kitchen cupboards for a cheerful dose of colour every time you reach for a coffee cup – like these gorgeous turquoise kitchen cupboards from A Beautiful Mess. Since Nelly moved out of her parents’ home in 1999, she has lived in ten different rentals – five in her native France, five around Perth. She has made significant changes to eight of them. “Most times I only repainted some rooms or the entire house; other times I did some major renovations, such as a full kitchen and bathroom,” she says (many of you were loved the renovation she did to this once-crappy surfer’s shack in Watermans Bay and she even renovated the bathroom of her current abode). But why on earth would anyone want to carry out renovations to a house that is not theirs, you ask? Nelly gets this all the time . “The response is somewhat very logical: Because I live here. It’s the house I wake up in every day. The house I kiss my partner good night in. The house my best friend and I had the most memorable and silliest uncontrollable laughter in. The house my daughter took her first steps in. The house that hosts some of the most ordinary and extraordinary moments of my life. My home. Whether I own it or not is just plain irrelevant. It is, in fact, very similar to a homeowner who is renovating for comfort and aesthetical reasons, and not necessarily with the view of adding value to his property." 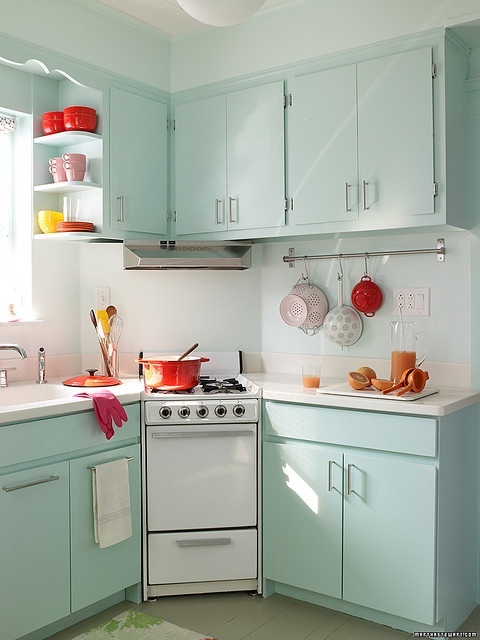 JUST ADD PAINT: The bright orange or mustard yellow of your 1970s kitchen cupboards hurting your eyes? White Knight do a terrific range of laminate paints and tile paints for updating tired kitchens and bathrooms. Nelly says she finds the French do not dissociate the concept of one’s home from ownership – a hefty 70 percent of them will never, ever own their own house. For them, making their house as comfortable as possible makes perfect sense. “Australians have been pretty lucky so far, with a very large majority of us being home owners of at least one property,” she says. “So for us Aussies, renting is always perceived as a very temporary measure before stepping in the golden pathway of home ownership. And because we see renting as temporary, we think it would be ridiculous to do anything. But for those of us who think that renting is going to be a little more than a short-term and who are not exactly living in their dream home, making some changes might be worth the effort." 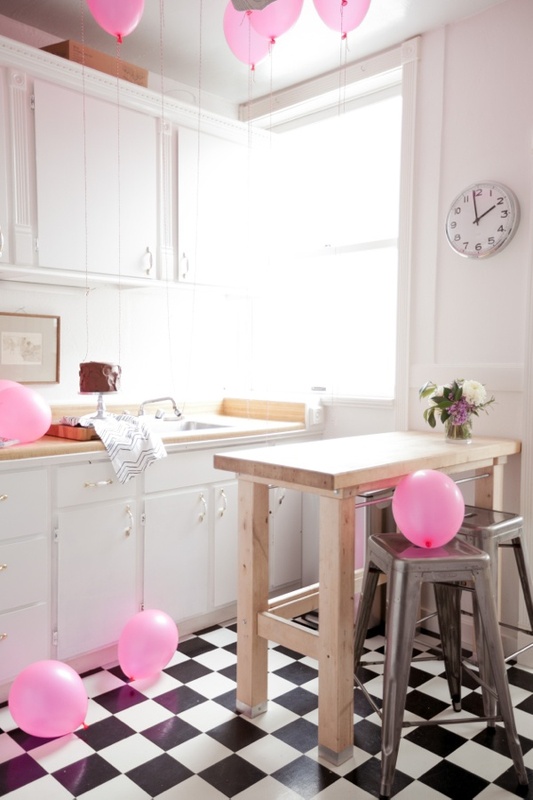 NO FEAR: Don't fear stick-on laminates and lino - these products have come a long way and these days there are many varieties that are fantastic for easily updating your home, whether you like the look of floorboards or tiles, like these chic black and white ones in Oh Happy Day! blogger Jordan Ferney's rental apartment in San Francisco. For good laminate flooring options try Bunnings for inexpensive options or Quick-Step for top-quality ranges. Nelly says many people think they need to wait til they get a mortgage. ‘What can I do to my home while I’m renting?’ you might think. ‘It’s better to wait until I move to my own house.’ But with prices going up, for many of us, the reality of home ownership is getting further and further away. So why should you wait for something that may happen in five or ten years? Why not starting by improving your home – whether you own it or not – now? If you have ever thought of potentially renovating your rented home, it may not be as complicated or ridiculous as you think!" It works better with a not-so-fresh property. You’ve just moved into an older home with peeling paint and nasty floorings? Not only your rent is probably a little cheaper than a similar but newer or better-maintained property in the same area, you are also more likely to get the landlord’s approval to do some work. Landlords and property managers are usually quite lucid about the property condition and they also know that a property that presents well is more valuable. So if you show that the changes you have in mind would refresh their outdated property, it is more likely to be approved. ADD SHEERS: Hang inexpensive sheer curtains over shabby or daed windows for a fresh update, as Nelly did to her Watermans Bay surf shack. Photo by Heather Robbins of Red Images Fine Photography. Don’t ask to make some changes straightaway. Firstly, it will enable you to know the property and better see what should be changed and what you can live with. Secondly, it will leave enough time to show the landlord you are reliable and can be trusted, by paying your rent on time, always having a spotless home at home inspections, etc. Identify the weak points of the house and work on that angle. The paint on the walls has yellowed or faded? There are lots of unsightly holes and hooks on the walls? The carpet is badly stained despite several professional attempts at cleaning it? Take lots of pictures of the issues and think about what you could do to solve them. HATE YOUR WALL COLOUR? Ask your landlord if you can paint your walls - if they fuss, you can offer to paint them back the shade they were when you leave. 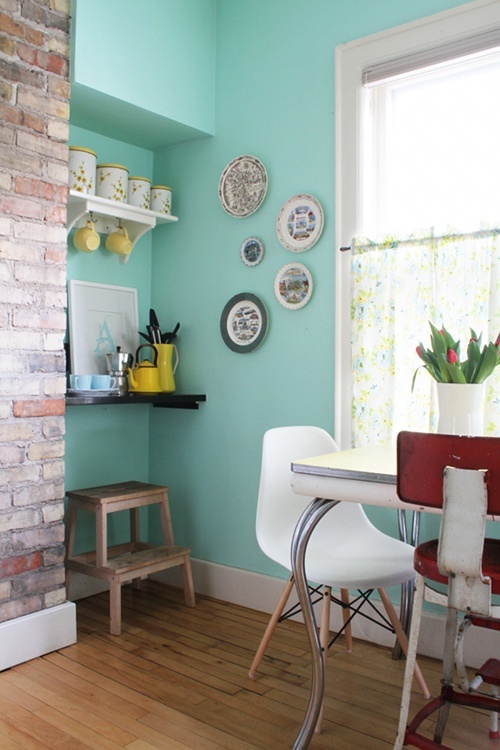 How gorgeous are these teal walls from this DesignSponge home? If you think several things could be done (let’s say, repainting the bedroom entirely and changing the flooring in the kitchen) always start by the task that is perceived to be the smallest. Between repainting the bedroom and changing the flooring, the first one would be perceived as the smallest job: it costs less and painting is easier to do (and to redo if things go wrong) than changing the flooring. Draft a “plan of attack” for your landlord. Be specific and give as many details as you can about the job: tasks (repair cracks, fill holes, repaint all walls of such room), selected colours, estimated timeframe and estimated costs. This plan will not only help you visualise and budget for your project; it will also be helpful for the next step. Now, you have to bear in mind that the property might be your home, but it is not your own. Step into the shoes of your landlord and think of what they would want. Think neutral colour scheme and items that are good value for money. If you live in a character house, consider this too and look for colours and materials that would be consistent with the period and style. ADD WHITE: Nelly asked her landlord if she could paint her Watermans Bay surf shack white throughout to give it a much nicer feeling of light and space - previously it was a hodgepodge of lurid colours. Photo by Heather Robbins of Red Images Fine Photography. Before starting any work on your rented home, it is absolutely crucial to get the written approval from your landlord or property manager. It is also a requirement of your tenancy that you leave the property in the same condition as you found it when you entered the tenancy agreement. So make sure to always seek approval for any changes you want to make prior to start. Show them the photos you’ve taken and use your plan of attack to explain to your landlord what changes you have in mind. Stress out how these changes will have a positive impact on their property. And if you’re keen and able to do the work yourself, tell them! It will show how involved and serious you are about your proposal. Offer as well to take “After” pictures and to let them inspect the property upon completion. This should reassure them. Now be aware that most landlords may approve the plan but may not want to finance it. On a few occasions though, they will. It depends entirely on the landlord but you will increase your chances by being upfront with the cost of your project and by insisting on the positive impact it will have on the value and/or appeal of the property. What if my landlord doesn’t want me to do anything? You’ve followed the plan and your landlord doesn’t want to make any permanent changes to your home? 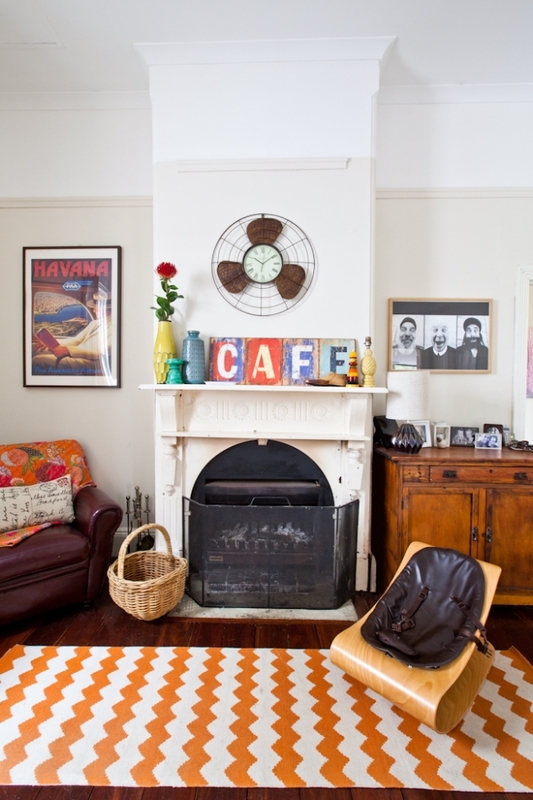 Don’t panic, there are still quite a few ways for you to personalise your home. Remember those weaknesses you’ve identified at step three? If you can’t fix them permanently, you can still distract your eyes away from them. Ugly bedroom paint? 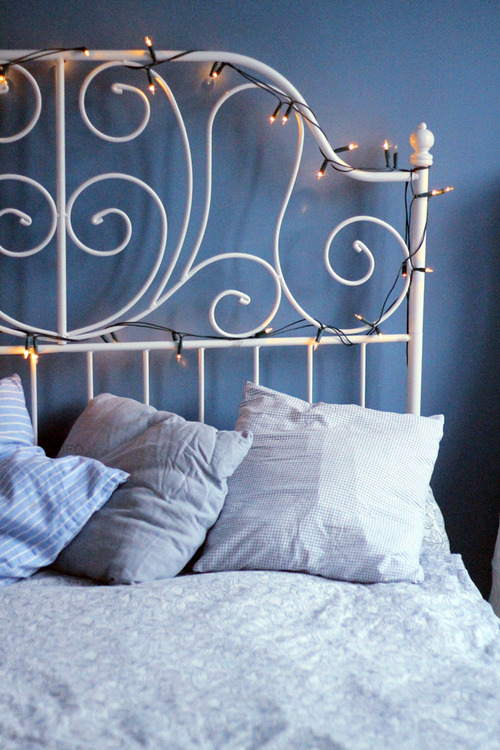 Invest in lovely, bold bedlinen with colours that don’t clash too much with the walls. Can’t put art on the wall? 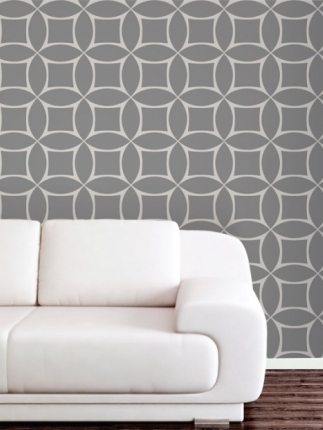 Use removable stickers, or put your wall art on furniture or on the floor if it is very large. 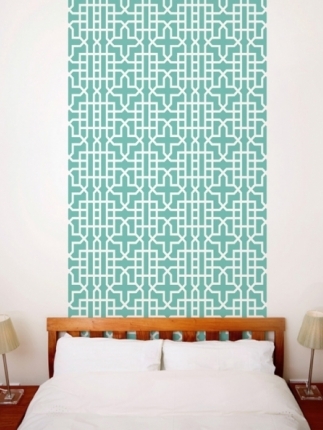 WALLPAPER WITHOUT GLUE: If your landlord has said 'no' to repainting, you might like to try stick-on, peel-off wallpaper like this Teal Geometric Wallpaper or these grey Circle Square stick-on tiles from Design Your Wall. Gross furniture? What if the home is partially furnished and you hate the furniture? Put a sofa cover or bedspread on the couch and lots of cushions; move the coffee table into a corner, use as a side table and buy another coffee table you like; put a great, colourful rug, etc. ABOVE: Lights are an inexpensive way to add prettiness to a room - just make sure they are LEDs if they are near flammable fabrics! Bad lighting? What if the room has little daylight and the only lighting is a neon on the ceiling? Install several sources of light throughout the room (floor lamp, table lamp, desk lamp, candles) to create the lighting which is appropriate to your activity and to the mood you want to set, etc. The room feels too clinical; not homey enough? Add textures and colours via soft furnishing. 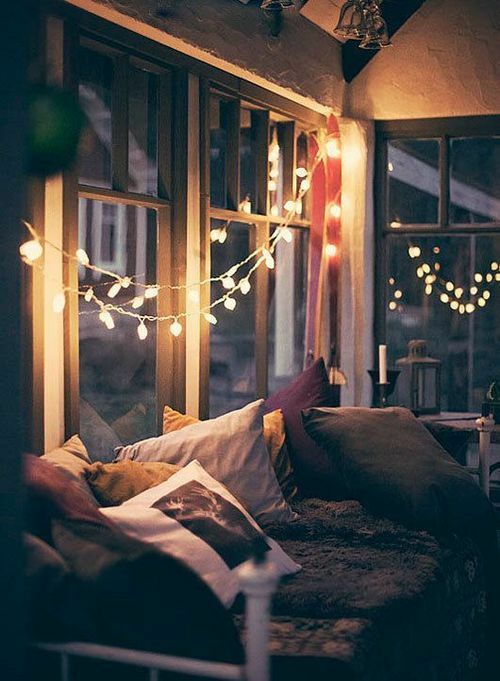 ABOVE LEFT: Pretty lights are a great way to dress up a rental. ABOVE RIGHT: Landlord won't let you paint? 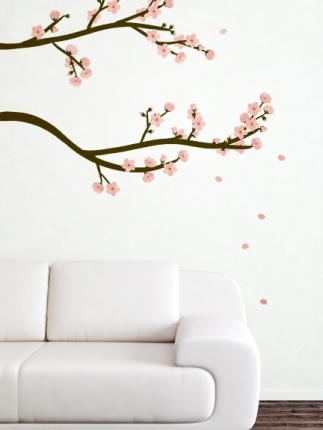 Wall decals like this cherry blossom design are a great way to dress up your walls. And an old-fashioned tip that’s making a comeback: never underestimate the power of indoor plants to give soul to a home! Great read. I rented numerous different homes and flats through my 20s and always tried to respect the properties. A good landlord will appreciate it and now as a landlady myself I know that I will always try to keep good tenants, ones that look after the property are worth there weight in gold! Very true! My dad has a villa on the same street as us that he has been renting out to the same lovely lady for the past 13 years, she's great and has become a friend, they even pet sit for each other when need be! She really looks after the house and the gardens and my dad is always more than happy for her to do what she likes to it because he knows she really respects the place. This was a great read. I'm about to move into the premises of a run down house and i am itching to make some changes! The house is cheap for 4 bedrooms (which i need for my 3 kids) and the house is in a great street in a good area of the town and close to my children's school and kinder. I have a 12 month lease and the landlord wants a long term tenant.. i have been trying to weigh up my options of either renovating the house to make it nice and homely whilst paying cheap rent, or move into another home in 12 months time that's nice and needs no work done to it, but is higher in rent... if i could renovate the place then i would stay at the house pretty much forever.. the only downside is that it's dead money. And the landlord may increase the rent if they think that the changes you have made to the property have increased its value. This happened to a friend of mine :( needless to say I'd be wanting to sign papers preventing that from happening! Or i definitely would not be doing any work to the property! Hi Lea, glad you enjoyed the story - hope it inspired you! Your future home sounds like it is a good one - the fact that if you could renovate you would stay forever in that location if you could and if you could renovate is fantastic. I would definitely try to make up papers to prevent rent increases due to home improvements - that would have been so sad and frustrating, what happened to your friend :-/ Hopefully you have a good landlord who can see the value in a great and trustworthy long-term tenant! Wishing you good luck! Hey Lea, we are in the same boat and wondering if we should get out of it too :) This article was great inspiration for us though! We ended up getting some peel and stick wallpapers that are removable from stickitupyourwall.com and some cool fairy lights off ebay for cheap and slowly made some great changes that were purely decorative and didn't change the property value so to say. 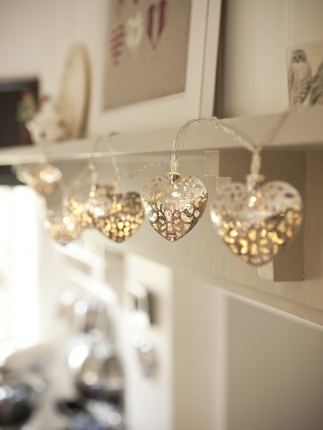 Either way, using the tips in this article we made our place a lot more lovely so thanks! Can I just stress that one about getting approval first? Also be specific about what you want to do and get clear and specific approval in writing. We came back from overseas to find the friend who had rented our house had decided to renovate without telling us. There was the bright blue and metalic silver walls in the bedroom, the carpets had been pulled up,thrown in the garden, and the beautiful baltic pine floors painted mission brown. Original Victorian wallpaper had been removed in one room. He had also decided to add cornices to 2 rooms. This in a locally significant heritage listed home. The problem is that your taste may be very different to the owner's. If it is a Victorian heritage house, then deciding you want modern could be a disaster. Some things, like painting floorboards is pretty much irreversible and very expensive to rectify. Oh my god!! That's awful! I would have been absolutely LIVID. Who the hell would paint beautiful baltic pine floors mission brown in the first place (let alone a property that doesn't even belong to you?!!) plus removing original Victorian wallpaper... and the other 'improvements'. I am shocked. I hope he realised the error of his ways and compensated you to try to restore it. That's unbelievable. Yes, getting approval is DEFINITELY the first and foremost thing any tenants should think about. And if approval is granted, to be really, really specific about exactly what is/isn't allowed. It's very sad when beautiful heritage details are destroyed. Awesome. I like how you organised things. Keep it up!